As automotive manufacturers compete on features of efficiency and safety, they are also battling to provide the best driving experience for their customers. As a result, vehicle engineering is becoming more complex, involving multiple disciplines. There is a growing desire to provide test drivers and evaluators with simulated driving experiences, so that their feedback can be incorporated early in the design process. Based on this, automakers are introducing a new element in the complex assessment process between virtual prototyping and vehicle on-road testing. With support from Maplesoft, Ansible Motion, a developer of driving simulator solutions, produces Driver-in-the-Loop (DIL) simulators for vehicle engineering. These high-end driving simulators allow automotive Original Equipment Manufacturers (OEMs), designers, and professional racing teams to test full vehicle configurations, from the engine through the transmission to the suspension and tires, using a human driver and a virtual vehicle. 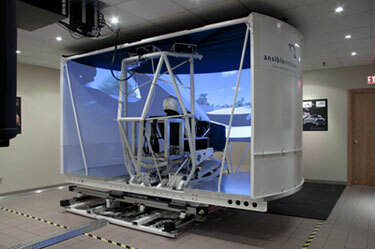 Ansible Motion also develops simulators for specialty vehicles to assist with driver training. Often test drivers and track engineers cannot sufficiently influence the vehicle design, because their feedback comes far too late in the prototyping process. Ansible Motion’s DIL simulators enable the implementation of a new validation stage in the design cycle by letting real drivers drive the virtual car. Driver feedback can then be taken into account and improvements made before any expensive physical prototypes are built. The simulator needs to be so accurate that the most sensitive professional driver can feel the smallest change in vehicle performance. The Ansible Motion DIL simulators work by running a virtual mathematical model of the vehicle and track, and linking it to a 6 degree of freedom motion platform designed expressly for automotive requirements by the company. The inputs to the virtual model are supplied by actions of the human driver in the simulator as he shifts, steers, brakes, and accelerates. In turn, the platform controller provides real-time input to the platform actuators, according to what happens to the vehicle model as it responds to the inputs. The physical simulator platform thus provides inertial feedback to the driver, allowing him/her to interact in a natural way with the virtual vehicle model. An inverse kinematics/dynamics model of the motion platform is required so the software knows what changes to the platform will produce the correct forces on the driver to simulate the vehicle in motion. The challenge here is to acquire these inverse relationships, which will provide the most accurate response of the system. To accomplish this, Ansible Motion used Maplesoft’s system-level modeling and simulation tool, MapleSim, to build the platform model, and to analytically solve for the inverse kinematic equations. Having access to these equations is crucial and this could not have been achieved without a symbolic/analytical computational engine such as Maple, the mathematical engine behind MapleSim. In effect, MapleSim gives the controller an exact analytical solution for the inverse kinematics, giving the best possible simulation. 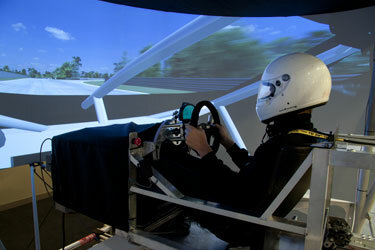 Ansible Motion designs and manufactures professional quality motion solutions for high end motorsport and road car engineering driving simulators. They offer novel and patented 6 degree of freedom motion platforms, handwheel feedback devices, as well as motion cueing and control solutions designed expressly for real-time automotive simulation applications. They are able to offer complete driving simulator installations with technical partners offering state of the art real time dynamic models, image generation, and hardware-in-the-loop simulation environments on both PC and Linux platforms. Engineers, scientists, and mathematicians use Maplesoft products to enable them to work better, faster, and smarter. Maplesoft’s customers include Ford, BMW, Bosch, Boeing, NASA, Canadian Space Agency, Canon, Motorola, Microsoft Research, Bloomberg, and DreamWorks, covering sectors such as automotive, aerospace, electronics, defense, energy, financial services, consumer products, and entertainment. With Toyota, Maplesoft founded the Plant Modeling Consortium to promote the development of new design techniques for automotive and related industries.